Bartons On Board! : Mimi & Papas House! Most Saturdays I bring both of my boys to Frizzles to meet Mimi & Papa (my parents). Sometimes my wife (Steph) comes or is sleeping in from working the night before. Mimi and Papa enjoy time playing with Tytus (now 2.5) and holding Ezra(and playing as much as a 2 month old does). 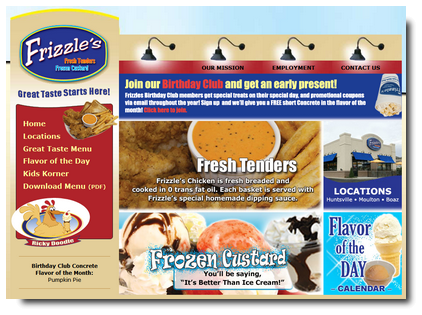 Frizzles is like a Dairy Queen, but not. They have frozen custard, not soft serve ice cream and the menu's have similar things by the way of chicken fingers and burgers. On Saturday morning they open fairly early for not serving breakfast. I think store hours they open by 9 or 9:30am and we show up between 930 and 10am. We are usually the only people there the first hour or so and Tytus is rip roaring and running around the restaurant inside. We order a drink and get a fry, or custard to share with Tytus. Occasionally we give him 'pieces' (pennies or change) to put in the big plastic Children's Miracle Network container which has your change go round & round and thru 'mousetrap' or Ferris Wheel kind of contraptions before finally falling to the bottom. Quite entertaining for him. We hang out for awhile and 'catch up' then go our separate ways. A good time is had by all! What has happened over time is Tytus has gotten so used to seeing Mimi & Papa at Frizzles (and have been there more times than their actual house) that Tytus now thinks Mimi & Papa LIVE at Frizzles! And if that's not funny enough...every time we drive by Frizzles he starts hollering 'Dat's Mimi & Papa's house, Mimi & Papa's house!!!" and will continue to do so till I agree with him!